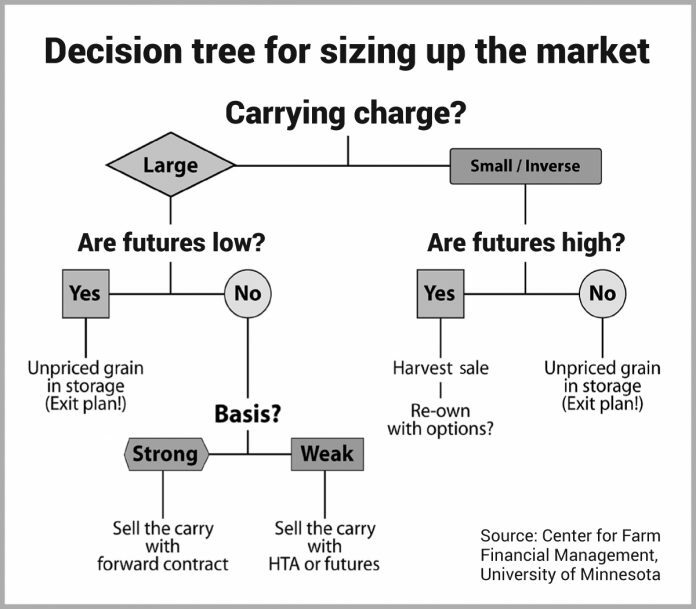 ALLENTOWN, Pa. — As we consider what we will do with the 2017 crops not already priced, I first look to the markets and calculate what carry may be available. Of course, it may be way too early for selling the carry on the expected harvest, but I believe it is never too early to formulate the beginnings of a plan. If we get started thinking, we are less likely to be surprised and caught off guard when the time does get here to market the harvest. What does carry mean in grain marketing? “Carry” in commodity marketing refers to the difference in price bids for two different delivery months. Any two months. This shows there is currently a positive carry in the corn market: Any future delivery month is offering a higher price than earlier deliveries. As an illustration from the above bids, I calculate a 35-cent carry between harvest and July delivery. Positive carry indicates the market is expecting a somewhat large harvest. At least large enough our buyers want us to go ahead and store much of it and bring it to them later in the marketing year. A positive carry suggests buyers are not necessarily concerned with securing adequate stocks over the coming year of usage. A positive carry does not suggest higher prices in future months. It suggests we may be able to secure a return to storage. The size of the offered carry helps us determine if we can capture a significant return to our storage enterprise. Carry large enough to cover shrink, quality deterioration risk and interest costs incurred during storage months may be a signal to go ahead and take today’s future deliver bid, store the crop and make delivery at the agreed upon time. Politics and policy, world events and alternative investor opportunities may also be worth a look as we gauge where our prices might go. This signal is not foolproof, but it does indicate current market sentiments and suggests appropriate marketing strategies. Think about it a minute. There are only three things we can do at harvest with any grain not yet committed; 1. sell it off the combine; 2. put it in storage unpriced; and 3. price it for future delivery and put in storage. To me, bins have two distinct purposes. The first is that bins allow us to speed up harvest — we do not have to run to the elevator and wait in line to unload. The second purpose is actual storage after harvest. When we talk about carry we are referring to longer-term storage. A large harvest challenges buyer and processor storage capacities. When carry is large, the market is anticipating a large harvest. 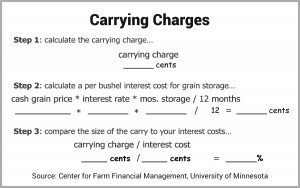 Using data from the University of Minnesota Center for Farm Financial Management, we believe carry is ”large” when it exceeds 140 percent of the interest cost to store grain. Large carry is a signal to farmers that the market wants us to store grain for later delivery. Carry can help us make the decision on which strategy might be most beneficial.